Boss (unfolding big map across table; talking carefully) Right … this is the plan then. … At 10:52, I shall approach the counter and purchase a watch costing £5.18.3d. I shall then give the watch to you, Vic. You’ll go straight to Norman’s Garage in East Street. You lads continue back up here at 10:56 and we rendezvous in the back room at the Cow and Sickle, at 11:15. All right, any questions? Larry We don’t seem to be doing anything illegal. Boss What do you mean? Larry Well … we’re paying for the watch. Larry (hesitating) Well… why are we paying for the watch? Boss (heavily) They wouldn’t give it to us if we didn’t pay for it, would they… eh? 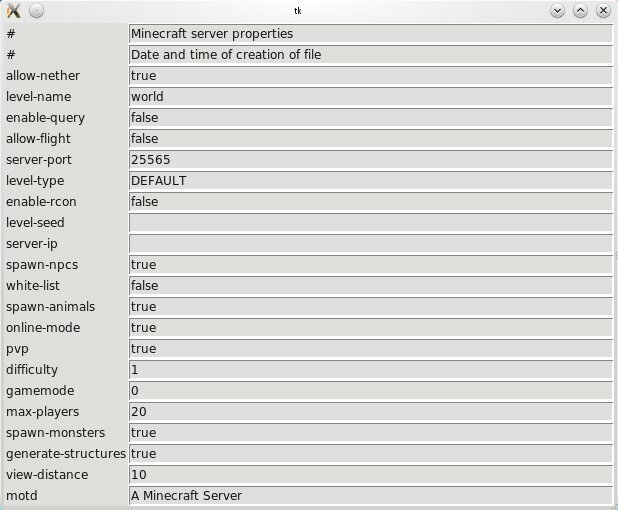 This is our final instalment [sic] of our Minecraft config editor. In the earlier tutorials we have done everything except actually updating the file. Before we do update the file though, we need to make a backup of it, so it’s these two things that we’re going to do now. The function could also use the rename() method from the os module. Unfortunately, this behaves differently depending on the operating system you are using, so to keep it simple I have avoided it. Exercise: Work out what this function is supposed to do, then confirm that it does it eg: start up a Python console, paste the definition in and then call the function with “server.properties” as a parameter. Extra Points: If you are on a Unix based system, use the diff command to show the differences between the original and .bup (there shouldn’t be any). Here we have introduced an array called dataToWrite. Where, in the last tute we just printed out the line, in this tute we are appending those lines to the dataToWrite array. Then, once they have been accumulated, we open the server.properties file (clearing it) then write our new data into it. Only one generation of backup is saved. We have used the global statement here to use the value of the fileName variable. This is a little messy, but is a consequence of how the program has evolved. One of the things that you might include here is a confirmation step. Before the data gets overwritten we might ask the user to confirm that they are going to write over their data, giving them a second chance if they clicked “Ok” by mistake. Exercise: confirm that “Ok” saves your edits (open server.properties in a text editor or (extra points) write some Python to read and print the contents of the file) and that “Cancel” doesn’t. The code is a little messy because of how it has evolved in the course of explaining it. Having code growing organically and getting messy is not unusual. Every once in a while you need to stop and clean it up. Cleaning it up can also allow you to restructure your code in ways you didn’t realise when you were writing it in the first place. My class names are naughty. They should start with a capital letter. Third Booth Ee ecky thump! Mr Mann It’s a really quick method of learning. write all of the key:value pairs to the new server.properties file. Unlike variables, widgets are not the same as what is stored in them. If we have an Entry widget called E and we want to store what has been typed there in a variable called text we can’t just write text = E. This is because E is not a variable as we understand it. Actually, E is an instance of a class. This would just make another reference to the same Entry widget with the name text. Rather, we want to “get” the current value of the text entered into E. It turns out that the Entry widget has a method (called get()) which gets that text for you. Note here that we are referencing the attribute configVal which is defined in the parent class. Also note that we’ve included a bit of logic here to ensure that those configuration values which start as ‘true’ or ‘false’ can only be ‘true’ or ‘false’. If you type something else into them it will be ignored. It is sufficient here to just say if self.isTrueFalse rather than if self.isTrueFalse is True (the “is True” is redundant). These go before the root.mainloop() line. At the moment, the Ok button just prints out the values of the items. This is so that we can test how it is working before we let it go editing the actual file. Exercise: run the code and confirm that: (a) your edits are captured and printed out; (b) if you enter anything but “true” or “false” for an item that takes only true and false, then the edit is ignored; and (c) that if you change a true to a false or vice versa, that that edit is captured. Furtively he looks round, then takes from the desk drawer a comic-book entitled ‘Thrills and Adventure’. We see the frames of the comic strip. A Superman-type character and a girl are shrinking from an explosion. She is saying ‘My God, his nose just exploded with enough force to destroy his kleenex’. In the next frame, the Superman character is saying ‘If only I had a kleenex to lend him – or even a linen handkerchief – but these trousers…!! No back pocket!’ In the frame beneath, he flies from side to side attempting to escape; finally he breaks through, bringing the two frames above down on himself. Cut to a picture of a safety curtain. Last tutorial we covered ‘parsing’. We broke a standard config file up into separate lines and then we broke each line into pairs, each pair having a ‘key’ and a ‘value’. If we’re to edit the file, we need a way to edit the values (and after that we’ll write the edited values back to the config file). We’re going to see how to use Tkinter to do that in this tutorial. Let’s start thinking about how a single key/value pair will look. I am thinking of having the key on the left hand side with a space to input the value on the right hand side. To do this we will use the Label widget that we’ve met before and the Text widget. Label is used to display static text – ie text that will not be edited, while the Text widget allows the user to edit the text which is displayed in the widget, and for the program to read what is entered in the widget. The Text widget is the GUI equivalent of raw_input() that we met so long ago. Here we first create a Tk() object, then create a label widget and a text widget in that object. We pack the label first and we pack it on the LEFT side (LEFT is actually the name of a constant in Tk which Tk translates to ‘put this on the left’) and pack the text widget on the right side. At location “1.0” we add the text “A Value” to the Text widget. Here the number “1.0” means “row 1, at character position 0”, which is to say, at the very start of the text. 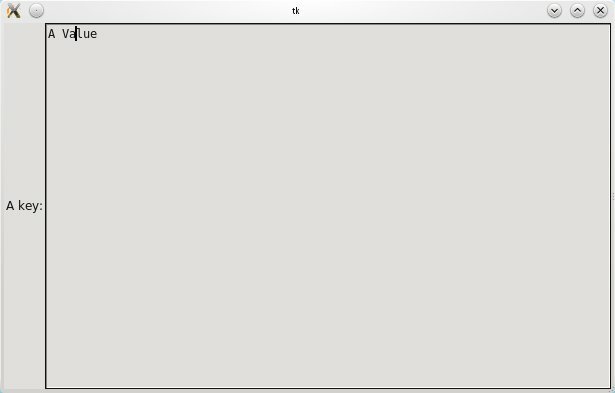 Which is sort of what I wanted – a label on the left, and an editable text box on the right (can you see the cursor in the screen shot?) – click the close window widget in the top right corner to close the window. Exercise: Type something into the text box. See if you can do it to the label. However, this isn’t really what I wanted. I wanted a little text box, not the enormous one I’ve got here. Since I didn’t specify a height and width for it, the Text widget used its default size (which is way too big). The user also doesn’t have any way to tell the program to use (or cancel) the edit. Let’s change the code to add an ok and cancel button, and to change the size of the text widget. #TODO: get values and write them to the file! I have added a couple of functions to be run when the ok and cancel buttons are clicked. The ok button’s function is still a little empty at the moment though… I have specified the width to be 60 characters and the height to be one row. Note these are not pixel measurements. If you change the size of the font the text box will also change. Notice also the way the geometry is working. The widgets which are pack(side=RIGHT) are added at the right in the order they are packed. If the buttons were packed last they would be between the label and the text window. Exercise: change the program so that the widgets are packed in a different order. What happens if you try side=TOP or side=BOTTOM? The value can be edited by the user typing directly into the text box. The text in the text box can also be edited programmatically, which is to say its contents can be changed by the program without the user typing. See the Tkinter documentation for details – or clamour on this site and I’ll add a tute. One thing that I don’t like about this layout is the fact the buttons are on the same line as the key label and value text. When you did the exercise above, you should have noticed that side=TOP and side=BOTTOM don’t really help, since you can’t position the ok and cancel buttons on the same line. What we need to use is the Frame widget. Frames can be thought of as empty spaces in which you can group widgets together. By treating the widgets within the Frame as a group, additional layouts can be achieved. Frames can be packed inside other frames. We will use two frames, one on top of the other. In the first frame we pack the label and text widgets. In the second frame we pack the two buttons. This is more like what I wanted (notice you can’t see the individual frames). One might quibble with the location of the ok and cancel buttons. Maybe they should be offset a little from the centre? Maybe they should be off to one side. In any event they are in the general layout that i was looking for: a key label and an editable value text above the ok and cancel buttons. Notice in the code that the widgets we used before have had their parent changed from root to either topFrame or bottomFrame? However these Frame widgets have root as their parent. So the original widgets we were using have effectively been pushed down one level in the hierarchy. We still don’t know how to get what the user has typed into the text box, but maybe I can leave that as an exercise for the reader (try textWidget.get(“1.0”,END)). Homework: change the okClicked() function so that it prints the contents of the text box before exiting. Use the hint in the previous paragraph. Voice Over And now for the very first time on the silver screen comes the film from two books which once shocked a generation. From Emily Brontë’s ‘Wuthering Heights’ and from the ‘International Guide to Semaphore Code’. Twentieth Century Vole presents ‘The Semaphore Version of Wuthering Heights’. In our last tutorial I left you with some homework to produce a docsting describing the steps we need to do in order to get our MineCraft config editor up and running. Did you get something like that? This is our script for writing the program. Most of it we can already do. In fact, the only thing we can’t do at the moment is ” displays each key, value entry on the screen allowing you to edit it”. Hey, notice anything different about that listing? I’ve found WordPress’s special tags for source code. If you run your mouse over it, some widgets will pop up so you can copy and paste the code. The other part of your homework was to save the contents of the listing in the previous tute to a file called “server.properties”. You need to do that in order to run this tute. Post a comment if you have problems. So, we have our class. What we need to do is read the data from the file (this, of course, won’t work if you haven’t already saved the file). See this tute for reading data from files. Now we will create a configItem instance for each line. However, we’ll need to keep them in something, so we make an array to do that first. Note: see this tute for what the %s means. * opened the file, read each line, and created an instance of the class for each line. * when a configItem is instantiated, it parses the data which it is initialised with. Next we will have to work out how to edit them. Homework: think about what might go wrong with this code.